East Side Bang for the Buck - Class A Arbitrage! A few months ago I prepared a report on the Manhattan East Side Submarket. Before the information gets outdated, I thought I would share it. So, without further ado . 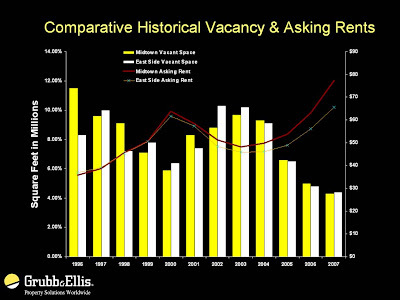 . .
- 37th St. – 60th St.
- East River – Lexington Ave.
- excludes Lexington Ave. and west side of Third Ave. from 39th to 46th St.
As you can see in the chart below, historically East Side rents and vacancy rates track Midtown Manhattan rents in general. What's interesting, however, is the gap between Midtown rents on the whole and East Side rents that has been growing since the year 2000. There is now a $10 difference! What is really telling, however, is this next chart, which tracks Midtown Class A & B rents and East Side Class A & B rents. As you can see above, there is basically no gap between Class B rents on the whole in Midtown and East Side Class B rents. 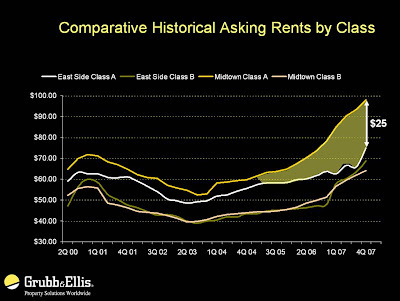 However, the gap between Class A rents in Midtown and Class A rents on the East side is huge - $25! I have some theories for which can account for some of the discrepancy (new class A inventory on the West Side, impact of the Plaza district, etc.). However, I do not believe that there is a good justification for this incredibly large discrepancy. Sure, the East Side does not have the best transportation in the world, but virtually all of the East Side's Class A buildings are on the West border. The point is, that if you are looking for Class A space in Midtown, there is rent arbitrage opportunity between the East Side and the rest of Midtown, and you should take advantage of it!